Grayson County has such a rich history. Back in 1966 a group of county residents started looking around for ways to preserve the heritage of our early settlers and came up with a dream to construct a frontier village where structures, artifacts and the way of life could be preserved for future generations. 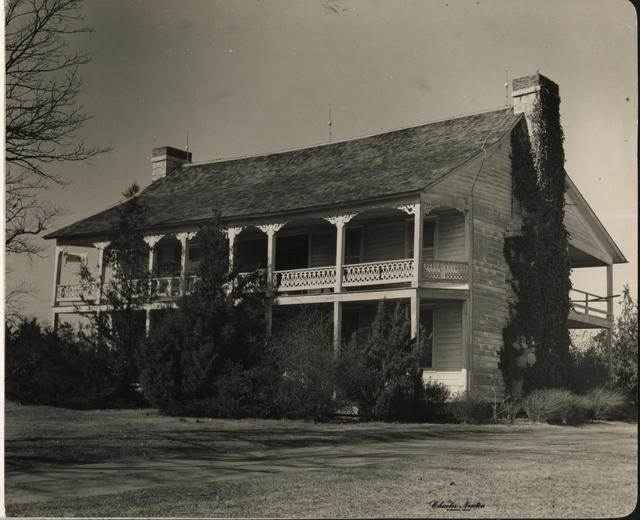 At a meeting of the Sherman Chamber of Commerce in October 1966, Otto Vehle, chairman of the conventions and visitors committee, reported that he had been approached by interested citizens concerned about the fate of Sherman’s oldest house, the Nettie Bass home at 215 West Houston. The property had been purchased for a downtown parking lot by Sherman Downtown. Many people wanted to see that the house was restored as a tourist attraction. Chamber board members rejected the idea, but Vehle didn’t give up and began looking for a way that the landmark could be used as a nucleus for a frontier village. Old Settlers Park Association on Grand Avenue in Sherman was contacted with the thought of moving it there. At a meeting in January 1967 the association voted to incorporate under the official name of Old Settlers Village of Grayson County and Vehle was named coordinator of all events. An organizational meeting was held in February and a charter was received from the state. In March another blow slowed progress when a satisfactory agreement couldn’t be worked out with Old Settlers Park for the village. But on Aug. 18, 1967, plans were made to move the Bass house to Loy Park, where Old Settlers Village of Grayson County planned to build a typical frontier village of the middle 1800s. Only snag was that an Aug. 25 deadline was very near for a decision to be made. A quickie campaign of five days raised $5,129 by telephone. Ground officially was broken Sept. 9, 1967, for the beginning of the village with County Judge Les Tribble, Commissioner Tom McKee and Sheriff Woody Blanton and his deputies taking part in the ceremony. But interest decreased somewhat during the next few years until Alan Smith was elected general manager in September 1971. He put in many hours of labor and things began to happen. Smith negotiated a 99-year lease of 17 acres with Grayson County Commissioners Court for $1. Commissioners paid $2,775 to have a chain link fence built around 14 acres at the site in November 1973, then the name was changed from Old Settlers Village to Grayson County Frontier Village in 1977 to avoid confusion with Old Settlers Park Association. Citation: West, Carolyn Effie. 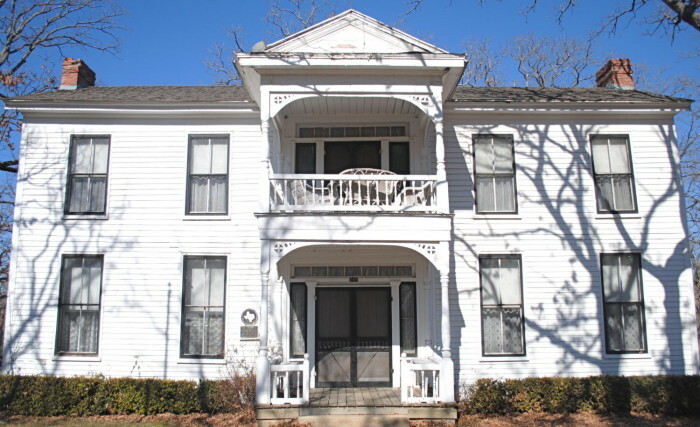 [Photograph of Old Bass Home], Photograph, December 2011-March 2012; (http://texashistory.unt.edu/ark:/67531/metapth256862/ : accessed January 21, 2015), University of North Texas Libraries, The Portal to Texas History, http://texashistory.unt.edu; crediting Private Collection of Carolyn West, Sherman , Texas. The Nettie Bass House probably is the most historic in the county. It was the first house in the county to have glass windows. People came from miles around to see them in the early days with many traveling all day to get to Sherman, camping out at night the returning home another day. Ted Nevil of Van Alstyne moved the house to the village site and the first thing that happened was that vandals broke the original window glass. George Ward of Sherman gave antique glass panes to replace them and board members papered the front hall, dining room, kitchen and upstairs hall and both upstairs bedrooms in 1977. The old Green Revival house was built by Dr. Robert Bullock in the middle 1850s with lumber shipped from Jefferson by oxen freight wagons. It was heated by four fireplaces and a beautiful rosewood staircase leads to the upstairs. Mrs. Robert Hocker, a widow from Virginia, moved into the house with her twin daughters in 1867. 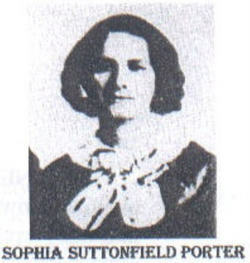 One of the daughters, Ada, married T.C. Bass that year. A daughter, Nettie, was born to the Basses in 1868 and she lived there her entire 97 years until her death. The house has an official Texas Historical Medallion. Secon﻿﻿d building moved onto the site was the W.L. Holder cabin that was built in the early 1840s near the intersection of Crawford Street Road and Harvey Lane in Denison. The cabin actually is the Cold Springs Schoolhouse. Mr. and Mrs. Holder were among the first six families to settle in Grayson County. They lived in tents for two years waiting for their land grants to be approved by the Republic of Texas. The little community built a school for their children, known as the Cold Spring School, believed to be the first school in the county. First teacher, Miss Maudie Mangrum, slept in the loft and ate with families of her students. A fireplace was the only way the building could be heated. The building had and still has split-log benches for the children to sit on. ﻿﻿﻿﻿﻿There are holes in some of the logs and the story handed down by the Holder descendants is that pegs were inserted in the holes with planks laid across them to serve as desks or shelves. Children paid tuition and furnished their own books. Citation: West, Carolyn Effie. [Photograph of Davis-Ansley Log Cabin Home]. The Portal to Texas History. http://texashistory.unt.edu/ark:/67531/metapth256726/. Accessed January 21, 2015. The Davis-Ansley log cabin is the third structure moved to the village. It is believed to be one of the first houses in the county and joined the village in 1975. The land on which it originally stood was part of a 640 acre grant to M.C. Davis in 1839 at Old Warren. 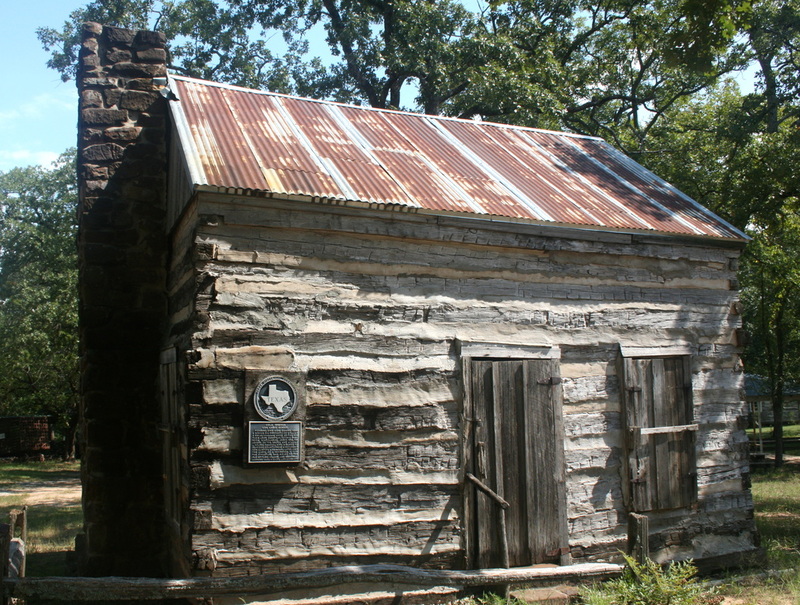 Micajah Davis, one of Grayson County’s founders, built the cabin. He and his wife, Mary, brought their family to Texas from Tennessee in 1835. It is assumed the house was built soon after the land grand was given. The cabin was built near a flowing spring about three miles east of Preston Road, which was widely traveled by immigrants coming in from the north. Oak logs were hand hewn into square logs and the building was put together with pegs and square head nails. It is 12 feet long, not counting the room with approximately 400 square feet of floor space. Fearing for the lives of his family because of Indian raids, Davis had moved to Old Fort Warren in Fannin County by the time the 1850 census was taken. The part of the land on which the cabin sat was willed to Davis’ daughter, Louisa Christian, who sold it to Joseph R. and Gilley Ansley in 1871. It is said that after the Civil War J.R. Ansley and wife, Gilley freed their slaves and came to Texas. They planned to go further west, but he died in 1873 and Gilley and their daughters or descendants lived in the cabin almost continually until John and Katherine Summers bought the property in 1953. They then donated it to Frontier Village in 1973. Fourth structure to join the village was a four room and bath frame house originally used by the caretaker. Now, however, the house is used for storage. Moving this house was a countywide project with the village paying to purchase it and have it moved. A plumbing company set the septic tank for a minimum fee and the county dug the lines. The Hendricks House, built in about 1863 on land given Jesse Elvis Hendricks by his father John, was built near the Shannon church northeast of Sherman. It originally was a one-room cabin with a loft, but Hendricks and his wife, Susan, added several rooms making it two stories in about 1870. The original cabin was moved to the village in 1978 and restored. However, only the downstairs rooms could be salvaged. The Bradley-Bodkin House that was built in the late 1840s on Iron Ore Bayou southwest of present-day Denison was donated to the village in 1979 by Coy and Hallie Wooten. The Evans-Carpenter cabin came to the park in 1985 from the Cherry Mound area. There’s also a church that has its own graveyard out back. The country store is filled with many of the items you would find in a real country store of the mid 1800s. It was moved from the Nellie Chambers estate on Paw Paw Hill east of Denison in 1990. You can find anything from bolts of material to barrels of beans, jellies, farming instruments and most anything else you might need back then. We even have a pot bellied stove that the spit and whittle group played dominoes around. Many farm instruments are on display along the back fence of the village. There’s a cook shack, built in 1921 and used by Siah Luby of Tom Bean to feed his threshing crew. The Jail Wagon that hauled and housed prisoners working on county roads up until 1930 is on exhibit. It is said that prisoners, primarily accused of vagrancy, were taken from work site to work site and kepe under lock and key at night. It even had a wooden floor halfway up the side to make two layers of sleeping room for as many as 30 men at a time. The Texas Legislature outlawed this practice in 1939. L.B. Burns was in the moving business in Denison for many years and to help establish his business, the company had a wagon that was used up until 1978 when it was donated to the Village by Betty Burns. It didn’t always haul furniture, but in later years was used in parades and other such events. There is a blacksmith shop, a dentist’s shop and even a beauty parlor complete with the early day permanent wave machines. In recent years we have added a newspaper office with early day equipment and a tack shop with saddles and other items. Another interesting display in the village is the Weaver Wagon. Beatrice Weaver Spangler donated the wagon that took her and her mother, Birdie, and her sister, Betty, all the way to Denver, CO or thereabouts and back, not once, but three times. Winnie, the cow, accompanied them on all three trips, about 4,000 miles, pulling draft part of the time when one of their horses died. The Fitzgerald House received a Texas Historical Medallion in 1970 and came to the village in 1990. It was built in 1866 on Red River, north of Bells. George Fitzgerald started cutting oak timber for the house before he left for the Civil War in 1859. He built the house when he returned from the war. Sophia Augenbaugh, Coffee, But, Porter is probably this area’s most colorful woman. She had a palatial home at Preston called Glen Eden. There she wined and dined such notables as Sam Houston and Robert E. Lee. She sold the Glen Eden mansion to Judge James G. Thompson, but lived there until her death in 1889. The site now is under the waters of Lake Texoma. Workmen building the lake are said to have burned much of the wood from Glen Eden to keep warm, but Nellie Chambers managed to salvage a good deal of it and assembled a cabin from some of the logs. That cabin also came to the village. Then there is the Lankford House that was built in 1847 east of Denison by William T. Lankford. In 1870 there was an epidemic of cholera that caused at least 80 deaths and the ceilings of the house were removed to build coffins for many of those who died. Bob West became the owner of the house in 1963 and Dr. Kenneth Kinnamon, who played at the house as a young boy, was instrumental in getting it donated to the village. Last, but by no means least is the home of James G. Thompson, who first settled in the mid 1930s on the south bank of the Red River at Preston Bend, where he operated a trading post. He built the house himself using hand-hewn logs for framing. Judge Thompson was appointed the first Chief Justice of Grayson County and was the first Postmaster at Preston. His home was moved to the village in 1990. A museum was added to the village in 1990 and a research center was added in 2002, both financed by grants from the Clara Blackford - W. Aubrey Smith Foundation. Here are housed many interesting and historic items, including portraits of outstanding civic leaders painted by Mrs. Russell Hanna a number of years ago. One of our most recent additions to the research room is the office of 15th District Judge Retired R.C. Vaughan. The furnishings are on loan from Grayson County and Judge Vaughan’s papers are in files for research by individuals. We’ve also added a digital library that contains obituaries, scanned early day newspapers and other historical information for as research sources. Shelves of historical volumes can be found in the Research room. A large glass case contains former Sheriff Woody Blanton’s saddle and other items donated by his brother and sister-in-law, Mr. and Mrs. Ben Blanton. The Resource room is available to be rented for occasions such as reunions, homecomings, weddings and other community gatherings. At certain times during the year it is very much in demand. Grayson County Helps with the upkeep. Other funding comes from donations, grants for special projects, memberships and small admission fees. Also, booklets about the structures in the village and other history of the county, are offered for sale along with a few souvenirs to raise funds. We also hold community activities to help support the village. The village is open seven days a week from 10 a.m. until 4 p.m.. It is governed by a board of directors made up of volunteers who also care for the cabins in the village.